Its last strong king was Ashurbanibal (669-627), though Egypt seceded quietly during his reign. Following his death the situation rapidly deteriorated, with a series of civil wars. In 626 Babylonia rose in revolt. Between 616 and 609 the Assyrian Empire was destroyed by an alliance of Medes and Babylonians. The Babylonians under Nebuchadnezzar II then took over most of the former Assyrian Empire, only Egypt remaining independent. The Medes carved out a large empire in the north and east, halted in the west only by the Lydian Kingdom in western Asia Minor. By the mid 6th century BC, the fertile crescent was divided between four powerful states, the Neo-Babylonian Empire, the Median Empire and the Kingdoms of Lydia and Egypt. Mixed units with front-rank spearmen, back rank archers. 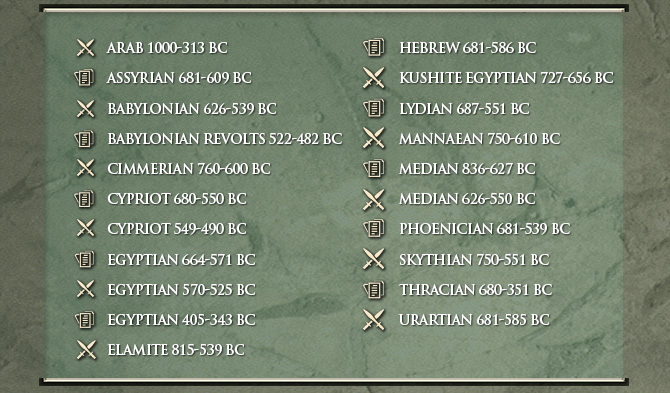 32 new units: Assyrian-style Heavy Chariots, Assyrian-style Cavalry, Veteran Assyrian-style Cavalry, Assyrian-style Guard Foot, Assyrian-style Heavy Foot, Assyrian-style Medium Foot, Raw Assyrian-style Medium Foot, Hebrew Foot, Gibborim, Hebrew Light Archers, Egyptian-style Heavy Chariots, Egyptian Spearmen, Egyptian Massed Archers, Egyptian Light Archers, Egyptian Light Javelinmen, Egyptian Irregular Foot, Elamite (Light) Chariots, (Near-Eastern) Archers, (Near-Eastern) Massed Archers, Mede Spearmen, Early Cavalry, Unarmoured Horse Archer Cavalry, Phoenician Spearmen, Lydian Hoplites, Sassanid Heavy Foot, (Sassanid) Massed Archers, Praetorian Guard, Praetorian Guard (Late), Greek Peltasts, Thracian Peltasts, Massed Thracian Peltasts, Thracian Spearmen. 35 new Quick Battles (each playable from either side). Expanded Field of Glory II Sandbox Campaigns module now includes all 191 army lists from Immortal Fire, Rise of Rome, Legions Triumphant, Age of Belisarius and Rise of Persia. (Purchase of the appropriate DLCs is necessary to access them all). 08 AUG 2018 Field of Glory II Rise of Persia New DLC is coming! Dont miss the Twitch Preview!